When a scientist or doctor has a financial conflict of interest, open disclosure in scientific publications might actually backfire and make bias worse, warn the editors of PLoS Medicine in an editorial out yesterday April 24. Furthermore, disclosure policies in general do nothing to confront the issues of the conflicts of interest themselves, they write. via Dangers of Disclosure | The Scientist. 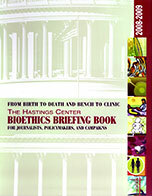 Video from the Bioethics Bootcamp sessions are now available. We’ve compiled them in the playlist below, in the order they took place, from the opening keynote to the panel with the editors. Watch them in order, or pick and choose from within the playlist or from the list at the right. The event will feature discussion and presentations for students, faculty, health care providers and the community. via Events, Fourth Annual Bioethics Symposium, University of Wisconsin School of Medicine and Public Health.